2018 Step Into the Circle Raises $61,000 - A Great Day for Fun and Fundraising! The Third Annual Beat the Streets Cliff Keen Step Into the Circle took place on Sunday, March 11 at 26 Bridge in DUMBO, Brooklyn. This year's adult wrestling tournament was the most successful yet, raising $61,365! Teams were made up of recent BTS alumni, former NCAA All-Americans, and wrestlers who haven't wrestled competitively in decades. The top fundraising team was Team UPS ($11,530) and the top fundraising individual was Yoshi Nakamura ($7,344), who was representing Team UPenn. Team UPS' Ron Mancuso, who has previously wrestled in SITC, was happy to be a part of the tournament again. Why does Mancuso, who is from Pittsburgh, make the trek to New York for SITC? " Beat the Streets is a great organization and I love giving back to the community. I've been here the last two years for SITC. Mancuso concluded by saying that he's "100%" coming back next year. Steve Santimauro (Head Boys Coach and Head Girls Coach at Madison High School, Head coach at Brooklyn Landmark Elementary) competed in SITC for his second consecutive year. "It's a lot of fun getting back on the mat competing. Anything to support Beat the Streets, I'm all about," said Santimauro. Brendan Buckley, BTSNY Executive Director, also stepped into the circle this year—he was runner up of the "Mediterranean Diet" bracket. "The third time running this event was a charm," said Buckley, who was very pleased with how several aspects of the event turned out. He was pleased by the presence of many comfort and skill levels-- "There were opportunities for everyone to participate; our BTS alumni, those whose career ended decades ago, and an elite group of wrestlers as evidenced by the 'South Beach Diet' weight class, a group that included nine individual NCAA All-American titles." Buckley was also impressed with the venue and general energy at the event. 26 Bridge "was a beautiful and intimate venue where fans were a mere few inches away from the action." He also observed that Step Into the Circle is beginning to share a few qualities with the Annual Benefit. 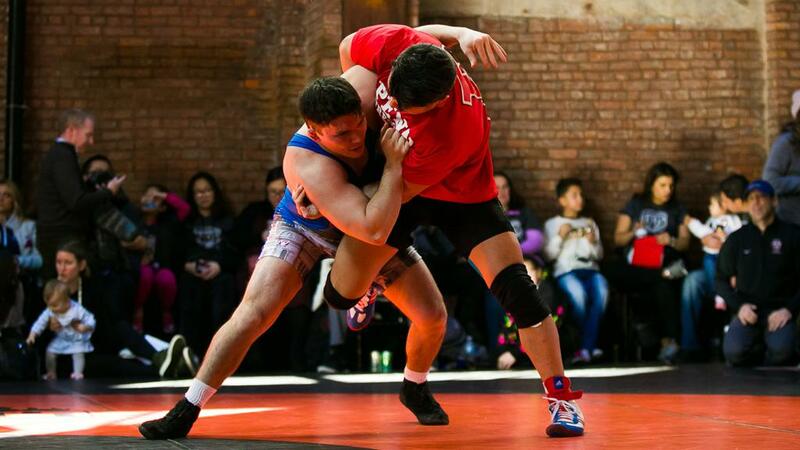 "Much like our annual benefit each May, we are so excited that Step Into the Circle has become a not to be missed event that raises funds for NYC's youth while bringing together the wrestling community in the greatest city in the world!" Ken Bigley, BTSNY Programming Consultant and PSAL Wrestling Commissioner, was also incredibly pleased with every aspect of the event. Bigley, who has been an organizer and participant for all three SITC events, described this year's SITC being the best "on every front - fundraising, energy, wrestling quality, enthusiasm, alumni involvement-- this year's event was tops." Bigley recognized the amazing fundraising chops displayed by various competitors and gave the following summary: "UPS, as always, was fantastic-- the UPS crew had 8 competitors and raised over 11K. Harvard, organized by BTS Board Member Jesse Jantzen, came out in a big way with three competitors and over 8K raised. For the first time, all of the Ivies, Harvard, Princeton, Columbia, Cornell, Penn, and Brown, had teams. We had two Board Members-- Mike Novogratz and Yoshi Nakamura, step into the circle, which was great! One other factor that distinguished this year's event was the involvement of our alumni. The James Madison Golden Knights raised over 2K and were 6th on the fundraising team leader board, and the Wingate Generals were in the top 12 raising nearly 1K." Thank you to Cliff Keen, Fusion Physical Therapy, Jersey Wine and Spirits, and New Belgium for sponsoring this event! Thank you to everyone who participated in this year's SITC, whether on or off the mat—all of you are the reason this event turned out to be a great fundraising success! The 2018 Step Into the Circle was truly a great event for the NYC wrestling community to come together—we look forward to seeing everyone again next year!